Well, it appears Steve Nash has worked his Canadian magic on the voters once again. Reports are circulating that Nash has won the MVP for the second consecutive season, boosting hopes for runty white guards all across North America. Clearly, Marion is the better player, as he averages nearly as many blocks as the taller Ilgauskas, while grabbing an extra 1.5 steals, fewer TOs, and more points per shot. A tougher call here. Diaw has never played this well in his career, so Nash has to get some credit for that. But the question is: Who’s a better player? Hughes. Again, a tough call. Bell’s Roland Rating is +.1, Gooden’s is -.4, which is essentially a toss-up. Interestingly, Bell’s stats are virtually identical to his previous campaigns, with the exception of him chucking up way more 3’s than ever before. I’ll call this one even. I had to mix this up a bit, as Barbosa isn’t really the 5th-best player, but it would be silly to match up Snow with Tim Thomas. Still, he is statistically superior to Snow. Again, no way you’d ever deal Murray for Thomas, unless Murray’s nickname reminds you of Flip Wilson and you’re looking for that whole nostalgia thing. An interesting comparison. Both were top 10 picks, both have been considered something of a disappointment in their careers, although Marshall has been a consistent contributor throughout his tenure, while Thomas has been a salary cap menace to many teams. 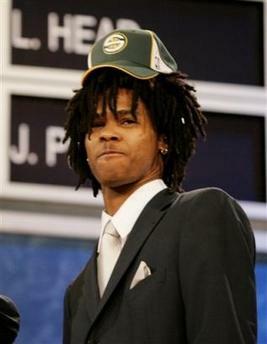 I think the majority of NBA GMs, in a world where the cap did not exist, would take Thomas. That’s enough of the comparisons, as no one cares whether I think Anderson Varejao is better than Eddie House. The important point is that in four of the six comparisons, the Suns’ player was better, and in only one match-up was the Cavs’ player definitely superior (Hughes). So, the result is that LBJ’s cast is easily worse than Nash’s, Amare or no Amare. And yet, James, who led his team to 50 wins is somehow less valuable than Nash, who led his team to 54? James, who scored 1,000 more points than Nash is less valuable? James, who averaged more steals and fewer turnovers than the “ultimate point guard” is less valuable? I don’t buy it. SEATTLE (AP) -- Ray Allen broke the NBA record for 3-pointers in a season, finishing with 269, and the Seattle SuperSonics wrapped up their disappointing season with a 109-98 victory over the playoff-bound Denver Nuggets on Wednesday night. Other great Ray moments from an otherwise forgettable season? How about his 42 points and game-winning shot in that insane double-overtime game against the Suns? Or what about his fight against the insane Keyon Dooling? Ah, such sweet memories. So, what are your favorite moments of this terrible, terrible season? Danny Fortson fouling himself out so he could get back on the exercise bike? Bob Weiss' disappearing act? Let's hear it! The Seattle Supersonics announced today that Bob Hill will be returning as head coach next season. So, do you think Bob's late-season magic can carry over to next year, or do you think they should've held out for Larry "Emergency Room" Brown? Let the ranting begin! "There are a lot of people in the league who have lost a lot of respect for him. People are starting to see he's not so clean." Um, yeah, okay, Bruce. I shouldn't slag Bowen too much, in that he came clean and owned up to his responsibility in the Spurs' loss to the Sonics on March 26th, when he and Allen got into a tussle and Bowen kicked Sugar Ray in the back. Bowen's kick prompted a technical and - later, thanks to a phone call from Allen to Stu Jackson - a $10,000 fine. Still, for Bruce Bowen to comment on another player's lack of cleanliness is somewhat silly. Whatever the case, tonight's game should be more than the typical season-ending fare one would expect from a team out of the playoffs. The Sonics are ... well, they're not exactly on fire, but with four consecutive wins, they're at least moving from the "Low" part of the burner to around 5 or 6. The Spurs, meanwhile, are questing for playoff positioning, so the game means a huge amount to S.A.
Ah, nothing like three Sonic wins in a row to conjur up images of De La Soul and brighter times. Courtesy of the Portland Trail Blazers (thanks, Nate! ), Seattle grabbed their third consecutive win last night as Ray Allen caught fire, Chris Wilcox continued his improbable Karl Malone impersonation, and Earl Watson continued to be everything the Sonics could have hoped for as Seattle rolled to a 121-108 win on Friday night. Kudos to Nick Collison for picking up the slack in suspended Rashard Lewis' absence, as the young Jayhawk posted 13 points and 6 boards in his first game back, and also posted the highest +/- on the team with +14 in only 20-odd minutes. With Johan Petro sidelined as well, Collison was at center quite a bit, and made the most of it, as he always seems to do. As much as Collison can be maligned for the faults in his game, the man is a dependable player who - while he gets in foul trouble way too quickly - is tough on defense, knows how to rebound, and can handle the rock. Can the Sonics make it four straight? Well, they'll have to knock off the Suns on Sunday to do it, but there's always hope. The Sonics issued a press release Wednesday announcing that they are entertaining offers from prospective buyers. In an even juicier bit, Schultz & Co. had to eat crow regarding Howie's ultimatum of "build it or we'll leave," issued on February 1st. According to the statement yesterday, "This ownership group has no interest in owning professional basketball franchises outside the state of Washington." Ah, yes, the sweet smell of failure. Ironically, with the Blazers also up for sale, the two teams will now compete for buyers, meaning the "woe is me" campaigns will have to be curtailed, inasmuch as no buyer wants to hear the lousy deal he's getting. It's expected the Sonics could fetch anywhere from $300 to $400 million on the open market, which would help defray the "losses" Schultz' group has incurred. At last! 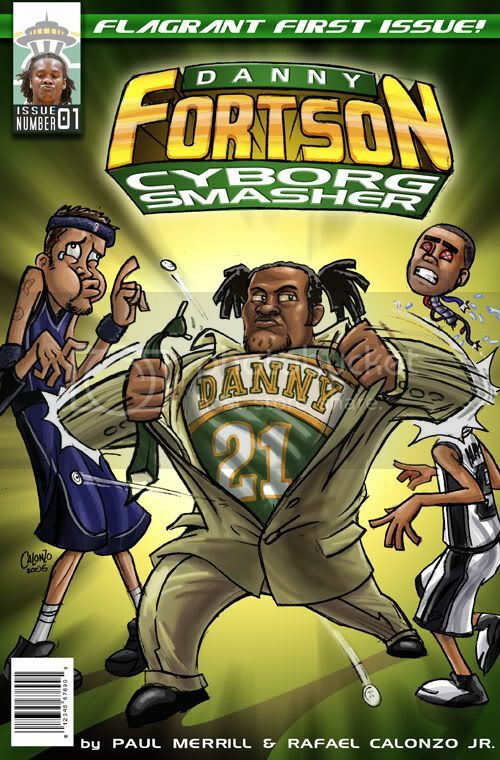 The thrilling conclusion to Danny Fortson: Cyborg Smasher Issue #1. First Robert Swift, now Johan Petro. As hard as it is to believe, both of Seattle's young centers have broken their noses this season, with Petro in line for surgery. Swift, a veteran of the process, told the Seattle Times that "[the doctors] will pop the bone back into place and he'll wear a mask for the rest of the season." Swift refused to comment on rumors that he paid Joel Pryzbilla $20 to break the nose. "That's just a bunch of internet gossip," Swift said. However, when you include Collison's broken nose last spring, you start thinking that something's up. Whatever the case, Bob Hill may want to wear blinders when he watches the action in the middle tonight. With Petro out, Mikki Moore and Swift are the only guys left to "defend" Yao Ming. Luckily, T-Mac is out, although as Rashard Lewis is out as well, it's pretty much a wash. 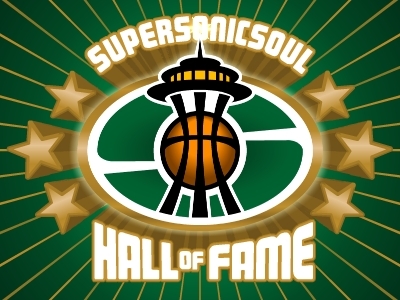 The Sonics are looking for revenge after getting hammered in Houston a week ago, and, hey, Rick Brunson's back in town! And Kevin Calabro will call another Sonic game! Who needs the playoffs with this intrigue!